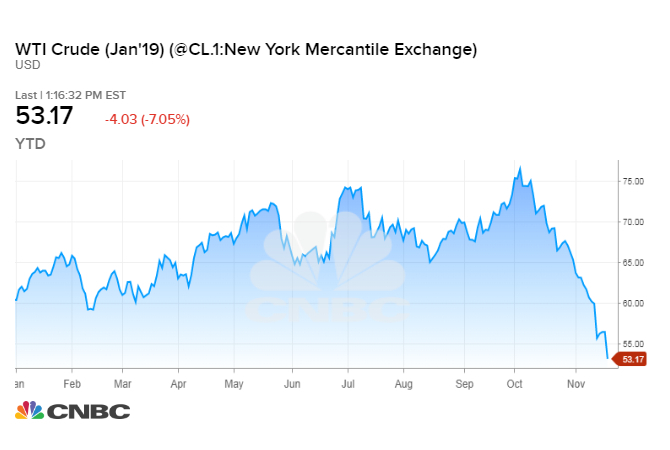 Oil prices plummeted as much as 7 percent on Tuesday, snapping four days of gains and renewing a sell-off that has plunged crude futures into a bear market. The renewed selling in the energy complex dovetailed with a sharp pullback in the stock market. The Dow Jones Industrial Average was down more than 500 points, after posting a nearly 400-point loss in the previous session. Crude futures and equities fell in tandem during a broad market sell-off last month that saw investors dump risk assets. "The next fear is that as the equities fall as a reflection of slowing economic growth, that's going to depress any growth in oil demand," said Andrew Lipow, president of Lipow Oil Associates. U.S. West Texas Intermediate settled Tuesday's session down $3.77, or 6.6 percent, at $53.43. The contract fell as low as $52.77 on Tuesday, its weakest price level since October 2017. U.S. crude prices have now dropped as much as 31 percent from a four-year high last month. Brent has tumbled nearly 29 percent from its recent high. Commodity watchers have grown more concerned that supply will outstrip demand next year. The market now expects OPEC, Russia and several other allied producers to launch a fresh round of output cuts in the coming weeks to prevent a price-crushing global crude glut. Crude futures fell to fresh session lows after President Donald Trump issued a statement saying the United States stands by Saudi Arabia following the slaying last month of journalist and U.S. resident Jamal Khashoggi by Saudi agents. The CIA has reportedly concluded that Saudi Crown Prince Mohammed bin Salman ordered Khashoggi's killing, but Trump cast doubt on that assessment on Tuesday, saying "maybe he did and maybe he didn't!" Trump's remarks come two weeks before the Saudi-led OPEC oil cartel meets with Russia and other producers to set global oil policy. The allied exporters are widely expected to cut output following the pullback in oil prices. Trump recently urged Saudi Arabia and OPEC against throttling back production, a move that would boost oil prices. Keeping energy costs down is a priority for the populist president. @realDonaldTrump: Hopefully, Saudi Arabia and OPEC will not be cutting oil production. Oil prices should be much lower based on supply! Some oil market watchers question whether the Saudis will risk alienating Trump by pushing for a large production cut, according to Helima Croft, global head of commodity strategy. "I think there is a corner of the market that says, 'Well wait a second, is Saudi Arabia really going to go forward with removing so many barrels in a situation where President Trump remains a stalwart ally of the Saudi government?" she told CNBC's "Squawk Box" on Monday. Croft said she still believes the Saudis will cut production. Several other analysts and traders also told CNBC they hold that view. "If the Saudis weren't going to cut production, they certainly are now after the price that happened today," said Anthony Grisanti, founder and president of GRZ Energy told "Futures Now" on Tuesday. "And if the Russians weren't on board with that, they certainly are now." Forecasters now see oil demand growing less than anticipated in 2019. Meanwhile, the world's top producers — the United States, Russia and Saudi Arabia — have been pumping at or near records. The 15-member OPEC cartel has also been ramping up production. Exacerbating the rise in global oil supplies, the Trump administration is allowing some of Iran's biggest customers to continue importing crude despite restoring sanctions on the Islamic Republic. OPEC and other nations agreed to hike output in June based in part on Trump's vows to strictly enforce the sanctions. Now, OPEC and its partners are poised to cut output by as much as 1.4 million barrels per day when they meet in Vienna, Austria on Dec. 6. Analysts and traders say the oil market rout has deepened due to momentum trading and investors dumping crude futures to buy natural gas contracts. Natural gas futures have surged about 40 percent over the last month on colder-than-average weather. "Certainly you're seeing sellers get stopped out. Any kind of long in the market just got flushed on this recent 5 percent move as it went down and kissed $53.50," Jeff Killburg, CEO of KKM Financial, told "Futures Now."